Chewy & soft pretzel bites are the ultimate comfort food and party snack. You won’t be able to stop reaching for bite after bite! In mixing bowl, dissolve yeast in warm water. Stir with a spoon until fairly mixed, about 1 minute. Some clusters of yeast may remain. Add salt, sugar, and melted butter; stir until fairly combined. Slowly add 3 cups of flour, 1 cup at a time. Mix with a wooden spoon (or dough hook attached to stand mixer) until dough is thick. Add ¾ cup more flour until the dough is no longer sticky. If it is still sticky, add up to ¼ cup more. Poke the dough with your finger - if it bounces back, it is ready to knead. Turn the dough out onto a lightly floured surface. Knead the dough for about 3 minutes and shape into a ball. Place in a large mixing bowl that has been lightly coated with nonstick spray. Cover and let the dough rest in a warm area for about 10 minutes. With a sharp knife, cut ball of dough into 6 sections. Roll the dough into six 20-inch long ropes. Cut the rope into 1½-inch pieces to make bites. Boil 9 cups of water with ⅔ cup of baking soda. Drop 8-10 pretzel bites into water and let sit for 20 seconds. Remove with a spatula or slotted spoon and place onto the prepared baking sheet. Make sure the bites aren't touching. Brush beaten egg over each pretzel bite. Sprinkle with sea salt. Bake batches for 15 minutes each, or until golden brown. Remove from oven and serve with cheese sauce or honey mustard. Pretzel bites remain fresh for up to 3 days in an airtight container, though they will lose some softness. Make ahead/ Freezing instructions: For freezing, the prepared pretzel dough (or shaped dough) can be refrigerated for up to one day or frozen in an airtight container for three months. Thaw frozen dough in the refrigerator overnight. Refrigerated dough can be shaped into pretzels while still cold, but allow some extra time for the pretzels to puff up before the baking soda bath and baking. 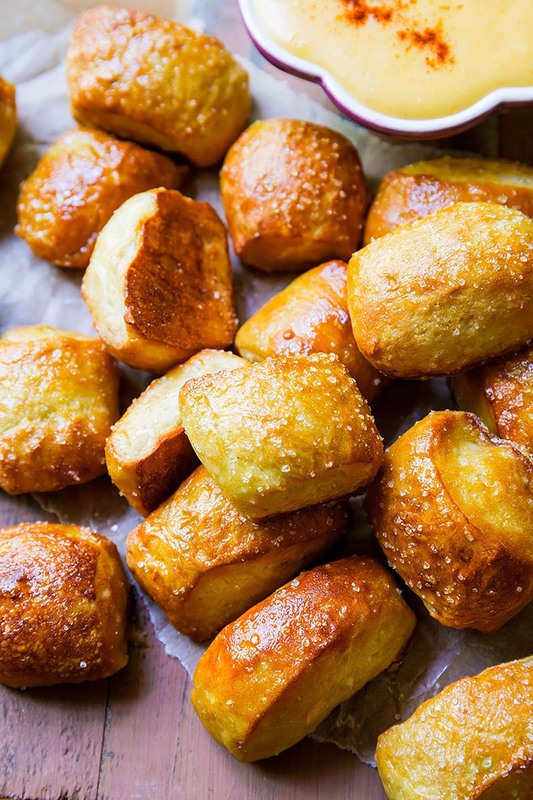 Baked pretzel bites freeze well for up to 3 months. Thaw and reheat in the oven at 300°F (149°C) until warm. These are amazing! Made an absolute mess of my stove from boiling the water and baking soda, but absolutely worth it. Will use a larger pan next time.